These findings are described in the article entitled A mixed model for landscape soil organic carbon prediction across continuous profile depth in the mountainous subtropics, recently published in the journal Geoderma (Geoderma 330 (2018) 177-192). This work was mainly conducted by Moritz Laub and Sergey Blagodatsky, Institute of Agricultural Sciences in the Tropics (Hans-Ruthenberg-Institute), University of Hohenheim. 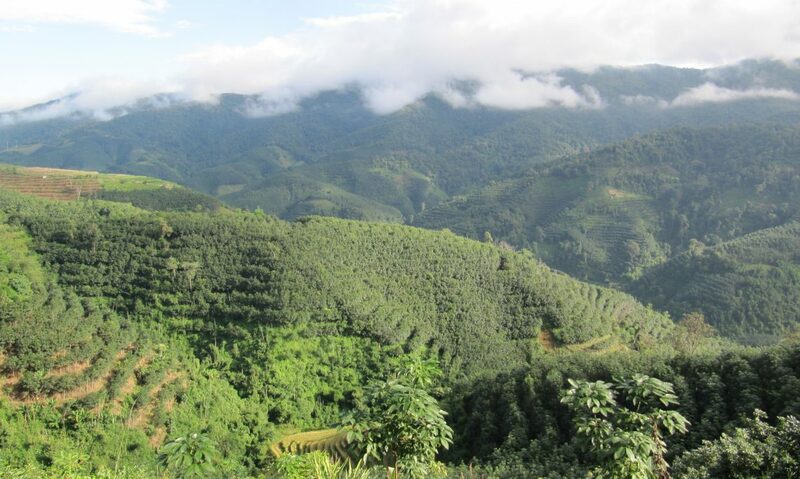 New market access of once remote areas has led to increasing agricultural production in mountainous Subtropic Areas. In the rapid change of such landscapes, soil resources are often lost at an alarming rate. The Naban Reserve, with an area of 270 km² (22°11′ N, 100°39′ E) in Yunnan Province, China, is no exception. It covers an elevation gradient of 600 to 2000 m above sea level. In the past few decades, the region has experienced a strong intensification of agricultural production from traditional rice paddies and slash and burn agriculture to sugar cane, maize, as well as the introduction of rubber (Liu et al., 2015). These new land uses often replaced native, or secondary forest areas and relatively low-intensity shrublands with occasional cropping. This land use change is often accompanied by a loss of aboveground carbon stocks. Even more concerning is the fact that many of these new land uses are much more intensive and disturbing to the local soils. The soils are, therefore, often losing considerable amounts of organic matter and are much more prone to erosion. This can lead to very fast deterioration of soil fertility and loss of soil resources. It is, therefore, critical to monitor changes in soil resources at the landscape level with a high resolution. For this purpose, digital soil mapping is needed. Some modeling approaches, used to create digital maps, also link the important soil properties, e.g. soil carbon stocks, to environmental factors, such as land use or steepness of slope. While maps can be used to estimate changes in soil properties over time, their link to environmental factors helps to identify soil conserving land uses and areas of special vulnerability. This helps to identify possible hotspot areas where conservation measures need to be implemented. Statistical mixed models are an easy and straightforward method to meet these two goals and can model the change of soil properties with depth. Therefore, they are effective 3D soil mapping tools. They also have the potential to upscale results to the larger the surrounding area, if the environmental factors are similar. 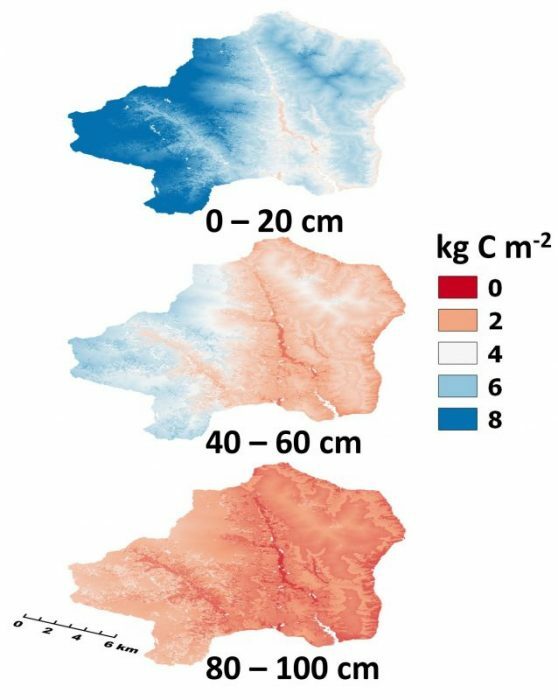 We showed that data from soil profiles from a smaller catchment of only 43 km² within the Naban reserve can be used to create maps of soil organic carbon content and stocks for any depth for the whole reserve. The results were very promising, even though the sampling design had to be adjusted due to the difficult terrain and was slightly biased for remote areas. With the statistical model, it is also possible to create prediction intervals for the soil properties that cover the real value at each location with a user-defined accuracy (usually set to 95% confidence). The statistical mixed model also has the advantage that it links soil properties to environmental factors. Through this, it was proven that perennial land uses in the Naban reserve, such as forest, rubber, and shrubland, had significantly higher carbon stocks than annual land uses, such as paddy rice or maize. The elevation of a site, which is strongly linked to mean annual temperature, also had a highly significant effect. It could be shown that the newly proposed three-dimensional statistical mixed model approach is superior to most established mapping techniques, which rely on modeling artificially-created, equal-sized depth intervals (such as 0–5 cm, 5-15 cm, down to 60–100 cm). The mixed model approach is relatively easy to apply, and its results are competitive to the more complex 3D geostatistical model such as the 3D kriging approach of Brus et al., (2016). Compared to many other mapping techniques, it has the added advantage that it can be upscaled. Sergey is a research scientist at the University of Hohenheim, currently working in AMF-Mercury project - Phytoremediation of mercury-contaminated mining sites in Ghana and Burkina Faso with arbuscular mycorrhizal fungi as a scientific co-ordinator.